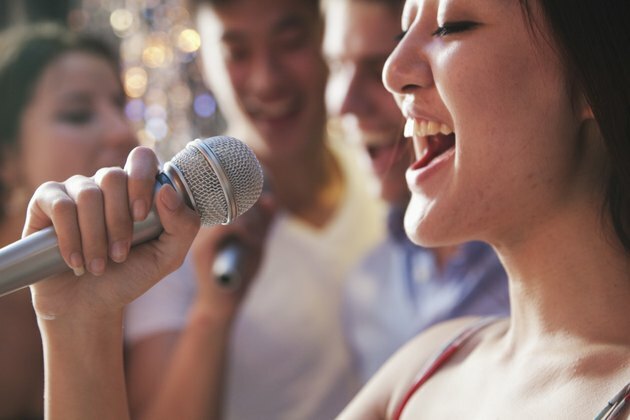 Vocalists, professional singers, and others who rely on their voices can enhance their performance with a healthy diet and by avoiding foods that can be harmful to their vocal health. Vocal cords are fragile and vibrate at a very fast rate when singing. Keeping them moist will go a long way toward preventing dryness, which can irritate them. One of the most important things you can do is drink a lot of water. The recommended eight glasses a day are not adequate for a vocalist, as this is one way to keep your vocal cords hydrated. Remember that when you drink, water goes down the esophagus to the stomach, not down the opening that goes to the vocal cords. Water must be carried through the bloodstream to the vocal cords. In addition to water, it is important to warm up your voice daily. Avoid yelling and straining your voice, as this causes wear and tear. Proper sleep and rest will help your voice quality. The best diet for a vocalist is one that promotes overall good health and limits or avoids fatty and fried foods. In addition to lots of water, almonds are rich in good protein and make a healthy snack. Fish and chicken are the best meat options. Eggs, apples, rice, and moderate portions of yellow vegetables are healthy choices. Your diet should include plenty of fruit, whole grains, and vegetables. These foods are rich in vitamins A, C and E, and they help to keep the mucus membranes healthy. Alcohol diminishes vocal control by causing constriction of the blood vessels in vocal tissue. Cold drinks contract and stiffen the throat and voice. Although some people like lemon water, you should avoid it before singing, as it will dry your throat. Other foods that are drying include salty foods, heavily peppered and spicy foods, and caffeine. Coffee, tea, sodas, and chocolate are common sources of caffeine, and should be limited. Dairy products should be avoided before a performance. Cheese, milk, yogurt, ice cream, and even some fruits such as bananas can cause excess mucus production. Fast food and high fat foods contribute to weight gain, which strains the body. Many of these foods are also high in salt and dry out the throat. Nuts and snack foods should be avoided before a performance because small bits can be left behind and irritate the throat (Reference 2). Avoid using mouthwash that contains alcohol. If you need to gargle, use salt water. Don't cradle the phone between your head and shoulder, as this causes muscle tension in the neck. Smoking and exposure to secondhand smoke can cause cancer of the vocal folds. Keeping your hands washed will help to prevent exposure to colds and viruses. Your Personal Singing Guide: Bad Singing Foods Harm Your Singing Voice!